‘Busy’…a boring excuse or a necessary diversion? My sister wants to know why I haven’t posted any blogs this month. I’m sort of wondering that myself and to be honest I want to say that I’ve been busy (my sister will laugh when she reads this…we always laugh when people, mostly ourselves, say they are busy…!). But, I’ve been sort of busy in a practical sense, I guess! I’ve been pre-occupied with writer’s groups and committees (unless you have been part of a writer’s committee don’t scoff…), renovating a small flat in Melbourne, unwell friends and politics (not that I’ve done much to change anything). I’ve also turned my thinking to trying to make sense (make readable perhaps) of my novel which is now in about sixth draft. So, you see I have plenty of excuses (always handy to have a list of excuses at the ready) for not writing blogs this month. There are times for all of us I suspect, when we fall away from the orderly and managed tasks to other less visible productive work…In the last month I’ve loitered at famous brand fabric and manchester stores, chosen materials and covered at least ten cushions. These cushions are my own creation. I only use old (but very clean so don’t panic!) cushions. I sew them by machine and then finish by hand, they take ages but I absolutely love the process, nothing gives me more satisfaction than turning something old into something new and wonderful. 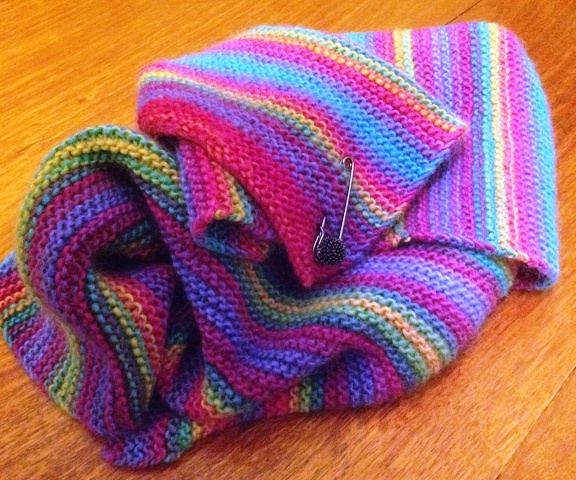 I have also knitted a wrap in multi coloured wool that I absolutely love…it does leave wool fibres over all of my other clothes and it slips a bit off my shoulders from time to time which results in endless tugging actions but the process of knitting this piece of warmth was heaven. So you are getting the drift by now (I hope) and I haven’t even gone into lengthy explanations about writing groups and my novel, let alone politics… So what is it from time to time that allows distractions to take over and intervene in the life of a blogger? Okay, I’ve given this some thought and I think that we have times when we need to re-fuel or simply have nothing of significance to say…it’s not that there is nothing to say but a matter of feeling the urge to comment on something that is important enough. About re-fueling…sometimes I have to take time out to be reflective and I think that’s what the cushion making does for me…the power of hands-on creation allows for a grounding experience that drives another process…thinking about life in a humble and meaningful way. There is another consequence of making and creating, at least for me there is…and this is the calm and stillness that accompanies the simple pleasure of making things. And so, you might well be asking, what’s this got to do with not writing a blog and making excuses of being too busy? Well, I think it has a lot to do with needing to be in the right space to write. When I’m sewing tiny hand stitches or knitting beautiful yarn my mind is concentrated on a tactile and creative experience…colour, precision, evenness, smooth, rough, shape and of course appearance. This process is mostly driven by my sense of visual creativity. When I write, particularly my blog writing, I concentrate on ideas, issues, rational and emotive reasoning and understanding. I tend to be driven by a passion for the ideas or notions within, hence intellectual creativity replaces visual creativity (or at least an attempt to do so). As I ponder these two processes that I freely float between, I sometimes wonder if they compliment each other or in fact just get in the way of excelling or even doing moderately well within one of the paradigms? This entry was posted in Education, Life, Music, People, Relationships, Uncategorized, Writing and tagged Avoidance, Blogging, Business, Creativity, Excuses, Intellectual, Process, Visual, writing. Bookmark the permalink. 4 Responses to ‘Busy’…a boring excuse or a necessary diversion? HM we do need to re-fuel now and then, there are so many creative avenues to choose from, that it is nice to have a balance and go from one to the other. I used to paint, I don’t anymore, my other creative side is writing the Eulogies for my families. It is still punching keys, but my mindset is making a story about their loved one’s life and not trying to obtain inspiration for my poetry continually. The cushions sound lovely – I have NO patience for sewing unfortunately. I smiled at the woollen wrap, it would be frustrating picking off the bits all the time, but there as you say is great satisfaction in making something with your own hands. Smiles. ‘Loitering at famous brand fabric & manchester stores’ sounds wonderful! A great post about self care, creativity and attending to different parts of the brain. I really love your comment re: ‘the calm & stillness that accompanies the simple pleasure of making things’. I really get that. Thanks.